I live a cram-packed life. With the day job, school at night, writing (The Owl’s my fav, duh! ), I’m always on the lookout for tuneage to lower my blood pressure and calm me down after a stress-filled day. I’m not talking about elevator music (Muzak, BLAH! ), but something with a tight groove, mellow melodies, and soothing vocals. My newest find, Work Drugs hits the spot and then some. 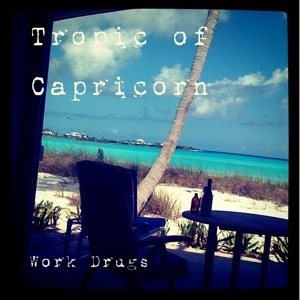 This duo (sometimes trio) from Philly really knows how to lay the grooves, and their new album, Tropic of Capricorn is evidence of that. The album title alone lends a sense to what the music is geared for as each track feels like waves lapping ashore. Each is different, with natural crescendos that climax to a point where they gently whisk into the next. It’s hard to pin-point tracks in particular, but some of my favs are “Rad Racer”, “Third Wave”, and “Dog Daze”, which sounds like the sun setting over the ocean as you reflect on your day. Exactly what the doctor ordered.